When people asked me what albums I was most looking forward to in 2011, the forthcoming record from Greg Dulli's Twilight Singers was always near the top of the list. The wait is almost over now as Dynamite Steps, the group's first album in five years, gets released on February 15th. Right from the get-go we're reminded of what we've been missing for the last five years. The album opener "Last Night In Town" starts with a slow swirl but quickly assumes a dirty groove. "Be Invited" is a typical dark and brooding number, enhanced by the vocal stylings of Dulli's Gutter Twins partner Mark Lanegan. Judging from his lyrical content, Dulli has been leading as bleak an existence as ever. One listen to the raunchy, in-your-face statement of "On the Corner" will confirm that. 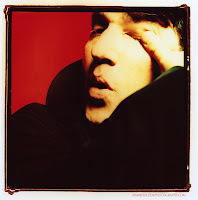 And let's face it, as fans we are happiest when Greg Dulli is sad/bitter/angry. It doesn't take long for Dynamite Steps to fall into familiar territory. Dulli's obviously comfortable operating in the shadowy, bluesy corners of rock and he doesn't stray far from that well-established formula. Unfortunately, the intensity that set previous works ablaze is simply absent this time around. "Get Lucky" is the perfect example of this. Usually the combination of Dulli's vocals and the arrangements are so incendiary that they make napalm look like a sunburn. They just never hit that level here. Even the presence of Ani Difranco on "Blackbird and the Fox" can't make one shake the been there/done that feeling that surrounds this record. That track in particular sounds like we've heard it a half dozen times before on Dulli albums. If this album serves as your introduction to Greg Dulli's work, it will be a revelation for you. However, long-time fans of The Afghan Whigs and Twilight Singers will know that Dulli has done much better work. Best tracks: "Last Night In Town", "Gunshots"
While I applaud your sincerity... I must disagree. As a longtime Dulli fan, this album takes some getting used to. It is not for the casual observer or bandwagon Dulli/Whigs/TS fan. At first, second and third listen, I thought it was good, but not the best he's done. Blackberry Belle will and should always have that distinction. Agreed! Takes a few listens to take it all in, but it grows on you. Dynamite Steps track is a good example..at first I wasn't crazy about it and now it is one of my favorite tracks on the album. It is a brilliant album with a little bit of everything.